The Phi Phi Lanta ferry is a gorgeous and relaxing cruise from one of Thailand's most celebrated islands to one of the countries more traditional and peaceful. As you leave Tonsai Bay you pass the end of Phi Phi Don cliffs and Phi Phi Ley. (Maya Bay, Phi Phi Ley is this island where they shot the movie 'The Beach' staring Leonardo Di Caprio and is the key attraction for the island.) At the last point of contact you see the full length of Long Beach and Shark Point in all it's glory. Here the smart resorts like Phi Phi The Beach Resort sit alongside the quirky and popular Phi Phi Hill Resort. Gazing south on the Phi Phi Lanta ferry you spy Koh Mai and Koh Ha to the south. These are significant to a trip to Koh Lanta as these are the islands, along with the silhouette of Phi Phi, that you see from your beachfront resort. As you watch the sunset on a Koh Lanta Beach you appreciate the one thing that Phi Phi Island doesn’t really do well. Phi Phi sunsets are very limited because the cliffs stand between the setting sun and most of the accommodation so it is great to get to an island where you can re-establish that integral rhythm with nature. 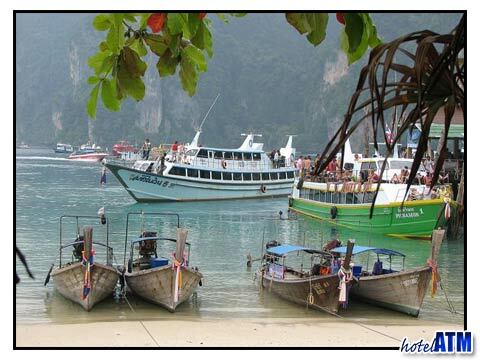 The Phi Phi Lanta ferry timetable is best detailed and boats are booked at the Phi Phi Lanta Ferry page. The departing 11.30 am ferry arrives at Saladan Pier at the north end of Koh Lanta at 12.30 pm. The usual crossing is the one hour subject to headwinds. From here the Koh Lanta resorts pick you up individually and transfer you. All you need to do is look out for the name of your resort you have booked and the process is complete. If you fancy choosing a resort when you get there, the guides on the Phi Phi Lanta ferries and or at Saladan pier will help with something to your budget. It is advised to book early as you are then able to compare online and get feedback and reviews before you commit. The Phi Phi Lanta ferry doesn't go all year due to the westerly waves and low season weather. The ferry runs November 1st until the end of April but does go every day. The exact ferry start and finish dates vary each year as the ferry company keeps an eye on the weather for safety reasons. 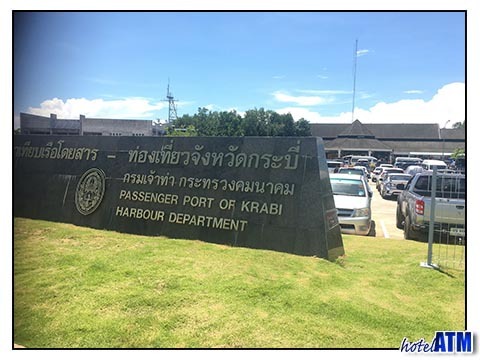 The Phi Phi Lanta transfer uses the Koh Phi Phi to Krabi ferry to get to the mainland. With the following westerly waves this is a straight forward crossing. From Krabi town you take a bus to Koh Lanta. The bus goes south past the Krabi International Airport to Huai Nam Khao just past Klong Thom before branching right on to Route 4206. The route takes you over the short chain ferry crossing to Koh Lanta Noi, an interesting place rarely stopped at by travelling tourists. Another 15 minute drive and the bus reaches the second short distance ferry trip which brings you in just east of Saladan. The bus arrives in the main bus stop of Lanta shortly after. From here you connect to your resort bus.